Abstract: Silicon, the wonder material of the 20th century, appears to have one more trick up its sleeve. After dominating the digital electronic industry, the bedrock of the digital world, it is now being considered as a platform of choice for building optoelectronic devices. Today, most of the building blocks that make up an optical communication system are already available in silicon. A silicon laser would complete the highly anticipated silicon photonics tool box. But, conventional wisdom holds that silicon cannot lase because of its indirect bandgap. Taking this axiom as a motivation rather than a deterrent, researchers have been rushing to prove their predecessors wrong and to unleash the mighty silicon laser. This talk will begin with a tutorial on why lasing is not possible in bulk silicon showing that while the indirect bandgap plays a role, it’s the absorption by free carriers that prevents optical amplification, the prerequisite to lasing. It will then review the recent breakthroughs based on nanophotonics as well as Raman Effect. The talk will conclude by arguing that silicon is the ideal Raman medium for mid wave IR (MWIR) wavelengths where high power sources of coherent radiation are needed for biochemical detection, infrared counter measure and other pressing applications. Biography: Bahram Jalali is a Professor of Electrical Engineering, the Director of the DARPA Center for Optical A/D System Technology (COAST) and the Director of the Optoelectronic Circuits and System Laboratory at UCLA. From 1988-1992, he was a Member of Technical Staff at the Physics Research Division of AT&T Bell Laboratories in Murray Hill, N.J. where he conducted research on ultrafast electronics and optoelectronics. His current research interests are in silicon photonics and ultrafast signal processing. 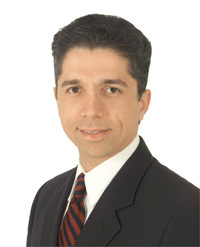 Dr. Jalali has published over 200 scientific papers in and holds 6 US patents. In 2005, he was chosen by the Scientific American Magazine as the 50 Leaders Shaping the Future of Technology. He is a Fellow of IEEE and a Fellow of Optical Society of America (OSA) and the Chair of the Los Angeles Chapter of the IEEE Lasers and Electro Optics Society (LEOS). He was the General Chair for the IEEE international conference on Microwave Photonics (MWP) in 2001 and its Steering Committee chair from 2001 – 2004. He is a member of the California Nano Systems Institute (CNSI). While on leave from UCLA from 1999-2001, Dr. Jalali founded Cognet Microsystems, a Los Angeles based fiber optic component company. He served as Company’s CEO, President and Chairman, from the company’s inception through its acquisition by Intel Corporation in April 2001. He has received the BridgeGate 20 Award for his contribution to the southern California economy. From 2001-2004, he served as a consultant at Intel Corporation. Dr. Jalali serves on the Board of Trustees of the California Science Center.